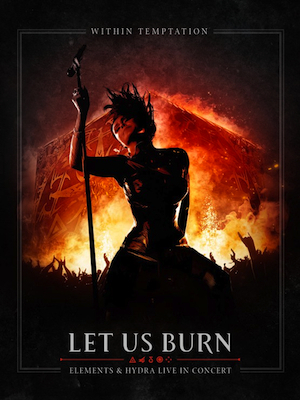 On November, 14 Dutch symphonic metal band Within Temptation, enjoying its worldwide success for almost two decades, is delivering us a new delicious piece of their concert pie: the live DVD/CD titled Let Us Burn – Elements & Hydra Live in Concert. As the title says, the release will include two major parts. The first one is the performance with orchestra at the Sportpaleis, in Antwerp, held specially to celebrate the 15th anniversary of the band. Having Black Symphony as the previous live video released, Elements would be the only show as spectacular as that one to get on live DVD, the vocalist Sharon den Adel stated earlier in the interiew for http://www.soniccathedral.com. “You don’t want to do a normal show as a DVD as a follow up after Black Symphony”, she said. “Black Symphony was over the top, you know how we did things. And Elements is the only thing you should bring out after something like that”. The performance even included a fire-spitting dragon on the stage. “I love dragons”, Sharon commented in the interview. The second part of the DVD is the final show at the Heineken Music Hall during the Hydra World Tour, recorded last May in Amsterdam. “Let Us Burn” will be released in four formats: DVD + 2 CDs, Blu-Ray + 2 CDs, a 2-CD set and in digital format. At the moment Within Temptation has just finished touring North America and is now heading for Latin America shows. Copyright (c) 2014 AlteRock.net. All Rights Reserved.